Fairmont The Queen Elizabeth is a legend in Montreal. Since opening its doors in 1958, The Queen Elizabeth has been at the forefront for hospitality and technological innovation. Designed by the prestigious architects of the Canadian National Railway Company, the hotel was among the first in North America to feature modern amenities like escalators, centralized air-conditioning, and direct-dial telephones. The Queen Elizabeth has continued this trend ever since, providing guests the latest in world-class customer service. This passion has allured visitors from all backgrounds to visit to the hotel, including Hollywood celebrities, international dignitaries, and royalty. The Queen Elizabeth has over 900 rooms on 21 floors with amenities, such as Le Labo Rose luxury toiletries, Nespresso machines, and an in-room refreshment center. The fully redesigned and renovated rooms are spacious, tastefully decorated, and modernized for the contemporary guest. Fairmont The Queen Elizabeth also has 39 meeting rooms spread over 80,000 square feet for groups of up to 1,600. Guests who wish to exercise have access to a 24-hour wellness center with state-of-the-art equipment, as well as an indoor pool and Jacuzzi. Further rest and relaxation can be found at Moment Spa, featuring full-service treatments. This historic hotel features a wide selection of dining options, including a first-of-its-kind urban market that offers local foods and other goodies. 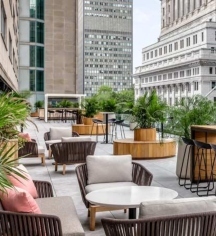 Fairmont The Queen Elizabeth occupies a prime spot in the city of Montreal, and is close to several world-renowned, amusement parks, museums, sports stadiums, and national parks. Should guests care to go on a day trip through Montreal, The Queen Elizabeth is the ideal starting point. Old Montreal, Canal Lachine, Parc Jean Drapeau and Le Mile-End are all accessible from the hotel for explorers and adventurers. And for avid shoppers, the Queen Elizabeth is connected by a tunnel to the famous underground super-mall, the Underground City, which spans over 19 miles. Fairmont The Queen Elizabeth, a member of Historic Hotels Worldwide since 2018, dates back to 1958. Airport Transportation: Service 24-7, bus 747. Travel time is approximately 45-60 mins. Must have exact change to pay. Cribs and Pack-in-Plays: Cribs are available upon request. Pack-in-plays are not available. Early Check-In/Late Check-Out: Available, depending upon availability and subject to a fee of $99 CAD plus tax. Extra Person Fees: A fee of $40 CAD per person will be assessed. Hotel/Resort Fees & Taxes: Reservations are subject to the Québec sales tax (QST), which is 9.975% of the total amount, and the Lodging fee of 3.5 %. Parking: Self-parking and valet parking are available on-site, subject to charge. Payment: All forms of payment are accepted. American Express, coupons, DebitCard, DinerClub, DiscoverCard, JCB, MasterCard, Visa, and Vouchers are accepted. Pet Policy: House-trained cats and dogs are allowed with a $25 CAD fee. Service animals are exempt from restrictions. 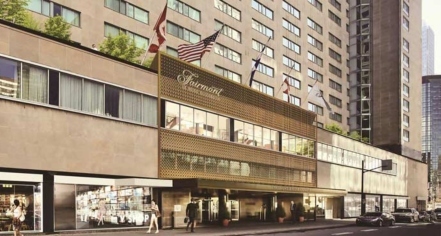 Fairmont The Queen Elizabeth is a legend in Montreal. Since opening its doors in 1958, The Queen Elizabeth has been at the forefront for hospitality and technological innovation. Learn more about the History of Fairmont The Queen Elizabeth .